This week, the great writer/director/Ohioan Jim Jarmusch releases just another masterpiece, the vampire flick Only Lovers Left Alive. While Jarmusch is certainly not an easy artist to peg, a vampire film was not exactly a predictable choice. Still, loads of the most prestigious filmmakers have made horror films. Back in 1960, Alfred Hitchcock made it acceptable for directors of immense talent to take on the genre. In 1991, we even had a horror film win best picture (and actor, actress, director, and screenplay). Some filmmakers, like Sam Raimi or Brian DePalma, are as well known for horror as for their more mainstream titles. Stanley Kubrick and Roman Polanski were equally at home in horror as they were in any genre. Other giants in the industry, like David Cronenberg and David Lynch, cut their teeth in horror before moving on, while a few, like Jarmusch and Martin Scorsese, dabbled in the genre late into an established career. Here is a peek at the horror output of some of the greats that you may have missed. Like all Bergman films, this hypnotic, surreal effort straddles lines of reality and unreality and aches with existential dread. But Bergman and his star, Max von Sydow, cross over into territory of the hallucinatory and grotesque, calling to mind ideas of vampires, insanity and bloodlust as one man confronts repressed desires as he awaits the birth of his child. Long before Peter Jackson went legit with the exceptional Heavenly Creatures, or became infamous for his work with hobbits and apes and more hobbits, he made his name back in New Zealand with some of the all time goriest, bloodiest, nastiest horror comedies ever produced. The best of these is Dead Alive, a bright, silly, outrageous bloodbath. For lovers of the genre, the director, or the Sumatran rat monkey, it is essential viewing. The Oscar winning director behind Amore, The White Ribbon, and Cache, made a horrific experiment of etiquette in 1997, and then again in 2007, with Funny Games. Made first in his native German, and a decade later, with nearly shot for shot integrity, in English, Funny Games upends the comfort of societal expectations in a number of ingenious and terrifying ways. Lars von Trier’s cinematic output had been punishing viewers for decades. In 2009, he finally embraced the genre that he’d been courting his whole career. Antichrist is a beautiful, poetic, painful, horrifying examination of guilt, laden with all the elements that mark a LVT effort. What’s unusual is that he takes, for the majority of the film, a traditional “cabin in the woods” approach, depositing his unique vision in well-worn horror territory. And once there, he embraces the genre with much zeal. And a few gardening tools. Copolla began his career under the tutelage of B-movie god Roger Corman, and Dementia 13 was one of his first solo flights as director. It wasn’t his last attempt at horror – we all remember the abysmal Dracula remake – but Dementia 13 marks the early promise of a guy who understands the power of killing a loved one in a rowboat on a lake. 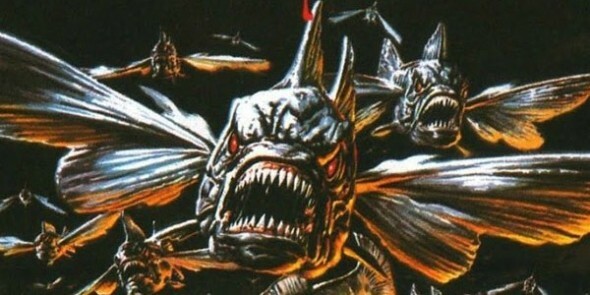 Just three years before taking Hollywood by storm with The Terminator, James Cameron showed absolutely no sign of competence behind the camera when he helmed the sequel to Joe Dante’s B-movie Piranha. This time around, those deadly man-eaters manifest a new mutation. They can fly! Sure, it might look like someone standing just off screen is throwing them at naked women and minorities, but they can fly, I tell you! This one is an underseen gem of bad cinema, and it offers an early peek at Cameron’s fixation with water, strong female leads, and Lance Henriksen.